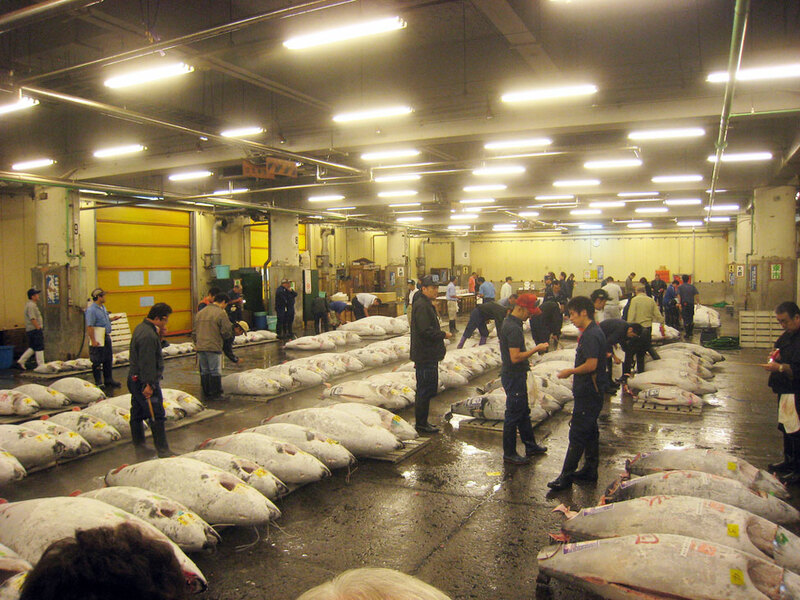 Tuna fish is auctioned at the Tsukiji Fish Market. Sushi or sashimi anyone? Visitors from all over the world visit the Tsukiji Fish Market. This market is the largest wholesale market for fish and seafood in the world. Some come to see the over 400 types of fish and seafood that are auctioned off each day. Others come to spend time in the shops and restaurants that surround the market. Of course some do both. Should you plan on visiting the market, prepare to arrive early. The many ships, trucks, and planes that deliver fresh seafood arrive around 3 a.m. Auctions start around 5:20 a.m., and end at 7 a.m.
All auction activity takes place in what is referred to as the “inner market.” Those who wish to watch the auctions in action will need to sit in a designated area. Note that only licensed vendors may participate in the auctions, but visitors are free to purchase all types of seafood from the surrounding shops. Early morning arrival is recommended if you intend to visit the shops and restaurants. 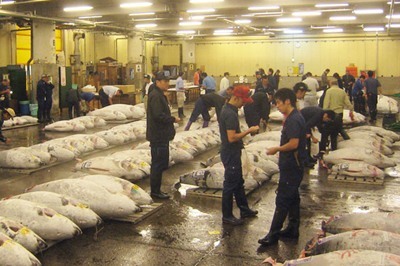 The Tsukiji Fish Market is alive with activity during the morning hours, but starts to slow down after the auctions are complete. Many shops and restaurants begin to close around 11 a.m., with the entire market closing at 1 p.m. so that it can be cleaned. Though it may seem early for sushi, few leave the market without sampling some of the freshest and exotic fish in the world. The Fish Market is located in the center of Tokyo. There are, however, plans to move the market to a new location in 2014. Construction of the new market which will be located in Toyosu, Koto will begin in 2013. A portion of the 900 retail booths, stalls, and restaurants will remain in place and visitors will be able to continue to visit these as usual.